More than 3 billion years ago, life appeared on planet Earth. We aren’t entirely sure how life arose on Earth, but a common idea is that it first formed around hydrothermal vents in our planet’s young oceans. These vents provide not only the thermal energy necessary to sustain life as we know it, they also provide a rich source of chemical compounds useful in forming living organisms. Even today deep sea hydrothermal vents are rich with a diversity of life. If such vents were the home of Earth’s tree of life, similar vents on other worlds might foster life as well. We normally think of possible alien life as existing on Earth-like worlds, with warm sunlight and firm ground, but life could actually be more common around the icy moons of a cold gas planet. That’s true even if we limit ourselves to life similar to terrestrial life, which is carbon based and dependent upon plentiful water. 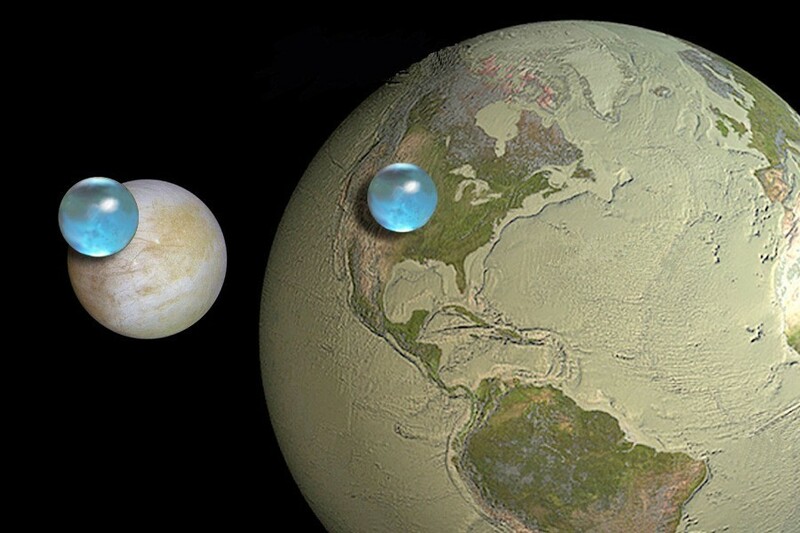 Water on Europa and Earth compared. Credit: Kevin Hand, Jack Cook, Howard Perlman. For one thing, water is far more common in the outer solar system than on Earth. Jupiter’s moon Europa, for example, has much more water than Earth. Ganymede, another Jovian moon, has about 70% more liquid water than Earth. Water is an incredibly common molecule in the solar system, and without the intense heat of the Sun to drive water away from these worlds, they keep much of their water. If these worlds were small planets, their water could have frozen into ice long ago (although even lonely Pluto hints of having liquid water beneath its surface). But these are moons orbiting a massive planet, and the gravitational stress upon them helps to keep their interior warm. We know that life could survive in the oceans of these worlds, but could it arise? New evidence suggests that it’s possible, at least for Saturn’s moon Enceladus. We’ve known that Enceladus has liquid water in its interior for a while. Water geysers have been seen erupting from the moon’s surface. But in October of 2015 the Cassini spacecraft flew directly through some of these plumes, giving the probe direct access to their composition. Chemical analysis found high levels of H2, which is likely produced by hydrothermal vents within its interior. In other words, the interior ocean of Enceladus is quite similar to the early oceans of Earth. Even if the conditions are right for life to form on Enceladus, it might not have had the time. We aren’t sure how old the moon is. It’s surface is relatively young, though that could be due to its thermal activity. Some computer models of the orbital dynamics of Saturn’s moons imply that all the moons closer to Saturn than Titan could be quite young, and Enceladus could be only 100 million years old. But other icy moons could have similar hydrothermal vents and are much older. Europa, for example, is about the same age as Earth and has liquid water. If it has vents similar to those on Enceladus, life could have formed on Europa long ago.